It was after a long time I went to cover the world largest ritual performance called Pooram, it performed in Vadukkumnatha temple in Trissur, Kerala. As per my plans i found the wonderful position to shoot. Its an Asias biggest event perform annually. The moderate showers that started around 2 p.m. on Wednesday could not dampen the spirits of the scintillating percussion concert `Elanjithara Melam’ held around that time. 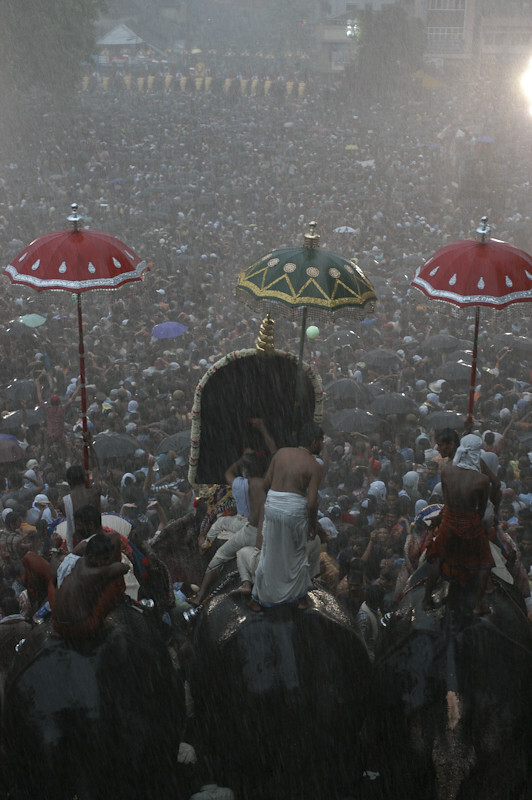 Later when heavy rain, accompanied by gusty winds lashed the city just after the beginning of the `Kudamattam’ (exchange of parasols) in the afternoon, they went on dancing, cheerfully yelling and waving their hands each time a set of parasols were exchanged by the friendly rivals of the Pooram, the Thiruvambady and Paramekkavu Devaswoms.